The DualShock 3 replaces the Sixaxis as the primary first-party controller for new Playstation 3 consoles. In terms of aesthetics and ergonomics, the controller hasn't changed since the introduction of the DualShock PS1 controller in 1997. The DualShock2 and 3 added analog functions to the face and shoulder buttons. The PS3's original Sixaxis controller was identical in function but lacked the force-feedback rumble and was prone to connectivity dropouts. The Sixaxis was the default controller and functions with all PS3 games. 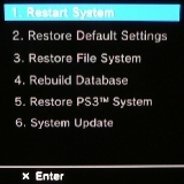 The DualShock3 did not have full force-feedback compatibility until firmware update 2.0, but all other functions worked normally. The Dualshock3 can be connected via USB or bluetooth to a PS3 console, and the PSPgo can be paired to it via bluetooth as well. Though there is no official Sony-driven support for PC, there are user-created drivers that can enable the controller to function as a standard USB game controller. For minor troubleshooting issues please check our controller connection issues guide and our other troubleshooting guides. In the future we will also be covering some minor repairs for both the dualshock and the original sixaxis in our repair section. Some of the items covered will be battery and analog stick replacement.